Oats, barley, and some products made from cereal. In botany, cereal, also known as grain, is any member of the grass family (Poaceae) that is cultivated for its edible starchy brans or fruit seeds (i.e., botanically a type of fruit called a caryopsis). The main cereal crops are wheat, rice, maize (corn), oats, barley, rye, and sorgham. Cereal crops or grains are used as food for people, as animal feed for livestock and poultry, and as part of industrial processes producing such products as alcohols and oils. 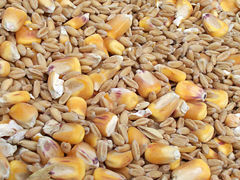 The term grain also is used for the edible seed or fruit of cereal plants. Sometimes, plants outside of the grass family that nonetheless are used in much the same way as the true grains, such as grinding them into flour, are included as cereals, such as buckwheat, amaranth, and quinoa. However, these non-Poaceaeplants more properly are designated as "pseudocereals" (UADA 2008a). Cereal grains are grown in greater quantities and provide more energy worldwide than any other type of crop; they are therefore staple crops as the basis of a traditional diet. They are also a rich source of carbohydrates. In some developing nations, grain in the form of rice or corn constitutes practically the entire diet. In developed nations, cereal consumption is both more moderate and varied but still substantial. Human beings have developed numerous cultivars of cereals in order to enhance such aspects as resistance to disease and insects. And triticale is a human produced hybrid of wheat (Triticum) and rye (Secale). The grain or edible seed of a cereal is known botanically as a caryopsis. A caryopsis is a type of simple dry fruit—one that is monocarpelate (formed from a single carpel) and indehiscent (not opening at maturity) and with the pericarp fused with the thin seed coat. It resembles an achene, which also is monocarpelate and indehiscent, except that in an achene a single seed nearly fills the pericarp, but does not adhere to it. The caryopsis is popularly called a grain and is the fruit typical of the family Poaceae (or Gramineae), such as wheat, rice, and corn. Considering that the fruit wall and the seed are intimately fused into a single unit, and the caryopsis or grain is a dry fruit, little concern is given to technically separating the terms "fruit" and "seed" in these plant structures. In many grains, the "hulls" to be separated before processing are actually flower bracts. In addition to the term cereal being used for certain grasses that produce edible seeds, the term also is used for certain products made from seeds (UADA 2008b). The word "cereal" derives from Ceres, the name of the pre-Roman goddess of harvest and agriculture. Grains are traditionally called corn in the United Kingdom and Ireland, but that word has became specified for maize in the United States, Canada, New Zealand, and Australia. Wheat, rice, and maize are the top three cereal crops in terms of global production; together wheat, maize, and rice provide about half of the global requirement of calories and protein (Biodiversity International 2007). Maize, wheat and rice, between them, accounted for 87 percent of all grain production, worldwide, and 43 percent of all food calories in 2003 (FAO 2008). Wheat is the more extensively planted, with over 217 million hectares planted in 2007, versus around 158 million hectares in maize and about the same in rice (FAO 2008). However, a greater weight of maize is produced each year than any other grain, as seen in the chart below, with over 784 million metric tons of maize produced worldwide. Barley ranks fourth among the cereals in terms of total world production (BarleyWorld 2006). 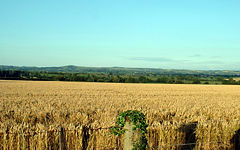 Rye is closely related to wheat and barley. Triticale is a hybrid of wheat and rye, created during the late nineteenth century. The following table shows annual production (metric tons) of cereal grains, in 1961, 2005, 2006, and 2007, ranked by 2007 production (FAO 2008). All but buckwheat and quinoa are true grasses (these two are pseudocereals). Maize 784,646,525 699,285,327 715,813,543 205,004,683 A staple food of peoples in North America, South America, and Africa and of livestock worldwide; often called "corn" or "Indian corn" in North America, Australia, and New Zealand. Millets 31,874,597 32,073,257 30,908,287 25,703,968 A group of similar but distinct cereals that form an important staple food in Asia and Africa. While each individual species has its own peculiarities, the cultivation of all cereal crops is similar. All are annual plants; consequently one planting yields one harvest. Wheat, rye, triticale, oats, barley, and spelt are the cool-season cereals. These are hardy plants that grow well in moderate weather and cease to grow in hot weather (approximately 30 °C but this varies by species and variety). The other warm-season cereals are tender and prefer hot weather. Cool-season cereals are well-adapted to temperate climates. Most varieties of a particular species are either winter or spring types. Winter varieties are sown in the autumn, germinate and grow vegetatively, then become dormant during winter. They resume growing in the springtime and mature in late spring or early summer. This cultivation system makes optimal use of water and frees the land for another crop early in the growing season. Winter varieties do not flower until springtime because they require vernalization (exposure to low temperature for a genetically determined length of time). Where winters are too warm for vernalization or exceed the hardiness of the crop (which varies by species and variety), farmers grow spring varieties. Spring cereals are planted in early springtime and mature later that same summer, without vernalization. Spring cereals typically require more irrigation and yield less than winter cereals. In developed countries, cereal crops are universally machine-harvested, typically using a combine harvester, which cuts, threshes, and winnows the grain during a single pass across the field. In developing countries, a variety of harvesting methods are in use, from combines to hand tools such as the scythe or cradle. In North America, farmers commonly deliver their newly harvested grain to a grain elevator, a large storage facility that consolidates the crops of many farmers. The farmer may sell the grain at the time of delivery or maintain ownership of a share of grain in the pool for later sale. Storage facilities should be protected from small grain pests, rodents and birds. 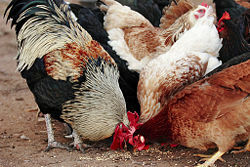 Chickens are often fed grains such as wheat or corn. Cereal grains supply most of their food energy as starch. They are also a significant source of protein, though the amino acid balance, with exceptions as noted below, is not optimal. 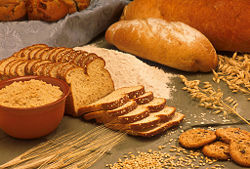 Whole grains (see below) are good sources of dietary fiber, unsaturated and essential fatty acids, several vitamins and dietary minerals, and other important phytonutrients. Rice is eaten as cooked entire grains, although rice flour is also produced. Oats are rolled, ground, or cut into bits (steel-cut oats) and cooked into porridge. Most other cereals are ground into flour or meal, which is milled; the outer layers of bran and germ are removed. This lessens the nutritional value, but makes the grain more resistant to degradation and makes the grain more appealing to many palates. Milled grains do keep better because the outer layers of the grains are rich in rancidity-prone fats. Overconsumption of milled cereals is sometimes blamed for obesity. The waste from milling is sometimes mixed into a prepared animal feed. Health-conscious people tend to prefer whole grains, which are not milled. Once (optionally) milled and ground, the resulting flour is made into bread, pasta, desserts, dumplings, and many other products. Besides cereals, flour is sometimes made from potatoes, chestnuts, and pulses (especially chickpeas, which is known as besan). Cereals are the main source of energy providing about 350 kcal per 100 grams. Cereal proteins are typically poor in nutritive quality, being deficient in essential amino acid lysine. The proteins of maize are particularly poor, being deficient in lysine and tryptophan (a precursor of niacin). Rice proteins are richer in lysine than other common cereal proteins and for this reason, rice protein is considered to be of better quality. Rice is a good source of B group vitamins, especially thiamine. It is devoid of vitamins A, D, C and is a poor source of calcium and iron. Certain other grains, including oats, quinoa, buckwheat, and grain amaranth (Pseudocereal, non-grasses), are very nutritious. Quinoa contains a balanced set of essential amino acids for humans, making it an unusually complete source of protein in plants. In English, cold breakfast cereals, as opposed to cooked porridges such as oatmeal, are simply called cereal. BarleyWorld.org. 2006. What Is Barley? Oregon State University. Retrieved August 26, 2008. Biodiversity International. 2007. Cereals Biodiversity International. Retrieved August 26, 2008. Food and Agriculture Organization (FAO). 2008. ProdSTAT FAOSTAT. Retrieved August 26, 2008. University of Arkansas Division of Agriculture (UADA). 2008a. Pseudocereal Glossary of Agricultural Production, Programs and Policy, 4th edition. Retrieved August 26, 2008. University of Arkansas Division of Agriculture (UADA). 2008b. Cereal Glossary of Agricultural Production, Programs and Policy, 4th edition. Retrieved August 26, 2008. This page was last modified on 28 April 2013, at 22:30.